John Murray, 4th Duke of Atholl, KT, PC, FRS (30 June 1755 – 29 September 1830), styled Marquess of Tullibardine from 1764 to 1774, was a Scottish peer. Murray was the eldest son of John Murray, 3rd Duke of Atholl, and his wife, Charlotte, 8th Baroness Strange, daughter of James Murray, 2nd Duke of Atholl. Lord George Murray and Lord Charles Murray-Aynsley were his younger brothers. He became known by the courtesy title Marquess of Tullibardine when his father succeeded to the dukedom in 1764. Murray succeeded his father as fourth Duke of Atholl in 1774 and was elected a Scottish Representative Peer. 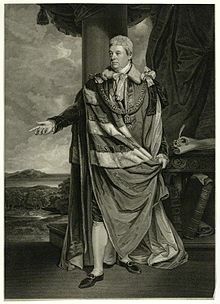 In 1786 he was created Baron Murray, of Stanley in the County of Gloucester, and Earl Strange in the Peerage of Great Britain, which gave him an automatic seat in the House of Lords. He later served as Lord-Lieutenant of Perthshire from 1794 to 1830 and was sworn of the Privy Council in 1797. In 1800 he was made a Knight of the Thistle. He succeeded his mother in the barony of Strange in 1805. He was also Grand Master of the Antient Grand Lodge of England from 1775 until 1781 and again from 1791 until 1812. He introduced Japanese Larch into Great Britain, planting the trees at Dunkeld, where they hybridized with the first European Larch in Britain, planted by his uncle, the second duke, and gave rise to the Dunkeld Larch. He wrote "Observations on Larch" in 1807 encouraging further its cultivation, which he practiced on a large scale. James Murray, 1st Baron Glenlyon (29 May 1782 – 12 October 1837) who married Emily Frances Northumberland and had 4 children including the 6th Duke. Edward Murray (11 September 1783 – 19 March 1795). Robert Murray (13 March 1785 – 5 February 1793). Frederick Murray (13 October 1788 – 11 April 1789). After his first wife's death in 1790 he married Marjory, daughter of James Forbes, 16th Lord Forbes, and Catherine Innes and widow of John Mackenzie, Lord MacLeod, on 11 March 1794. They had two children who both died young. Atholl died in September 1830, aged 75, and was succeeded by his eldest son, John. The Duchess of Atholl died in October 1842, aged 81. ^ "No. 12775". The London Gazette. 5 August 1786. p. 351.